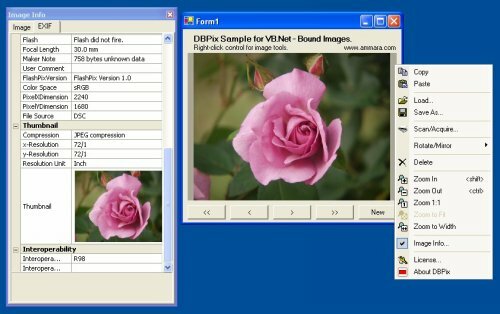 Binding Images, Photos & Pictures to a binary database field in VB.Net, using the DBPix Image Control. Download and install the DBPix control, using the developers kit link at the top right of this page (if not already installed). Download the sample and extract the Zip file. Run the file VBSimpDotNet.exe in the bin folder. The form shown in the screenshot above is displayed. Click the buttons to navigate through the records. Right-click on the DBPix control to see available tools, eg Load an image, view EXIF info, rotate etc. Create a new record by clicking 'New', then add an image - use the context menu to load/paste/scan, or simply drop a file. Once DBPix is added to the toolbox in your development environment you can use it like standard bindable controls. To set the bindings expand the (DataBindings) property and click '...' next to (Advanced) to display the 'Advanced Data Binding' dialog. The property to Bind is 'Image'. Note that VB.Net doesn't seem to allow selection of a binary field in the drop-down list of bindings, but you can select an adjacent field then correct the field name.